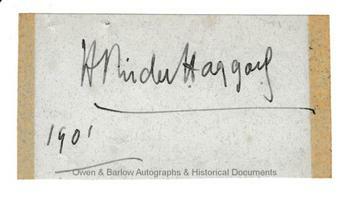 SIR HENRY RIDER HAGGARD autograph Signature. English novelist. Author of 'King Solomon's Mines', 'She', etc. Autograph signature and date (1901) on paper piece. 8.5 x 4.5 cms (3.5 x 1.75 inches). Old mounting marks to borders, pinholes to top edge. Very good. A nice, clear example of Henry Rider Haggard's signature. Probably a 'presentation signature' purposely provided, rather than a signature clipped from a letter or document (hence the positioning and presence of the date and the pinholes indicating it was originally attached to an accompanying letter).